So, what happens next? Normally when a major policy like this gets so crushingly rejected – by 230 votes, when Theresa May had reportedly been hoping for a defeat by “only” 70- 100 votes – the PM would resign and/or a fresh election called. Unfortunately for Britain and especially sadly for the future of its youth – there is no visible path to reversing the result of the 2016 referendum, and rejoining Europe. It seems that the suicide note that is Brexit will still be carried out regardless, in its essentials. It was always about ending free movement, and that won’t change. But first, a few housekeeping details. Thanks to an amendment successfully tabled by Tory rebels last week, May has to return to Parliament in the next three days with a Plan B. That requirement though, can be met by her simply saying that she will be engaging in further talks. Only slightly more seriously, Labour leader Jeremy Corbyn has moved a vote of confidence that will be decided – and probably defeated – tomorrow. In some respects this is Corbyn’s token gesture to his own radicals who have been asking him to chart a clear course for Labour towards a second referendum. Given that any such course would be (a) divisive internally for Labour (b) fiercely divisive among the electorate at large and as such (c) be a relief and godsend to the Conservatives, Corbyn is astutely keeping the spotlight on the government, even though his ‘no confidence’ vote will almost certainly be evaluated tomorrow (and defeated) along party lines. Much as many Tory MPs despise the dreadful May, the Conservative Party is unlikely to vote for an early election that they would, in all likelihood, lose – especially since they would have to go into an early election with May still at the helm. Because the Conservatives held a leadership vote late last year, May cannot be challenged again until late 2019. The one near-certainty is that there will have to be an extension of the Article 50 deadline of 29 March. 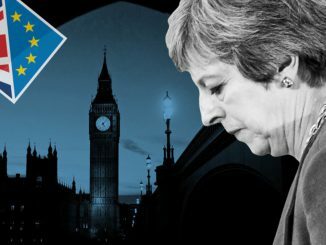 Neither the EU or Britain want the carnage that a “no deal” Brexit would entail – and Theresa May had been using that nightmare prospect to try and stampede the British public, her own Party and Parliament into grudging acceptance of her wretched deal. She failed. Now that her deal is dead, the cross-canvassing of MPs support for a range of possible options can begin. All of them would require extending the 29 March deadline. None of them would enable Britain to deviate significantly from the economically and socially damaging path of leaving Europe that it has embarked on. A three-figure margin [of defeat] will encourage MPs to try to seize control of the Brexit process – for example, by demanding a series of indicative votes on a possible plan B – including a Final Say referendum; a Norway plus arrangement inside the single market and a customs union; an EU-Canada-style free trade agreement and a “managed no deal”. Supporters of the different options are keen for their plan to be “the last one still standing” after all the others have been rejected, so much will depend on how such indicative votes were held. Note: A “Final Say” referendum would be a yes/no on whatever Parliament is proposing – and not a vote to revisit Remain as an option. Before any indicative votes are held, there will be a lot of secret canvassing – a process that will reportedly be carried out by civil servants (under the overall management of May’s EU emissary Olly Robbins) with the aim of trying to see which option might eventually command a majority in the Commons. However, it is not expected that the process would consider options that involve reversing the referendum result. Government strategists believe Corbyn wants to avoid being forced into supporting a second referendum – and hope he might seize on the option of helping to shape the Brexit deal instead. Somehow any such cross-party sounding out on compromises would have to be conducted surreptitiously, given the potential for fallout – among Labour supporters in particular – of being seen to be playing footsy with the enemy. Once all the token gestures have been exhausted, Corbyn is going to have to face up to the rebels within his own ranks. Absurdly, Corbyn is still being portrayed by the media as a wild-eyed socialist; the reality is that on Brexit, Corbyn is a lot more intent on enacting some version of Brexit than most members of the Labour Party would be. Unfortunately for Britain, a Remain that includes any meaningful degree of freedom of movement is still an orphan, with no political parent wishing to claim it. That figures. All along, Brexit has been a political project that has been largely driven by anti-immigrant sentiment. The fact that Britain might now consider staying within a permanent customs union (aka the “Norway” model) as the price of axing freedom of movement only underlines that fact. In essence, a generation of embittered older Britons have chosen, at great cost to Britain, to deny a future for their children within Europe. Neither May nor Corbyn look capable of doing anything significant about that grim fact. Footnote: Now that May’s deal is well and truly dead, and beyond revival by merely a few tweaks to the Irish backstop… are there any signs that the EU could be open to further talks ? Apparently yes, according to Germany’s Foreign Minister. If so, this means an Article 50 deadline extension would become inevitable. And there’s nothing that I can do….